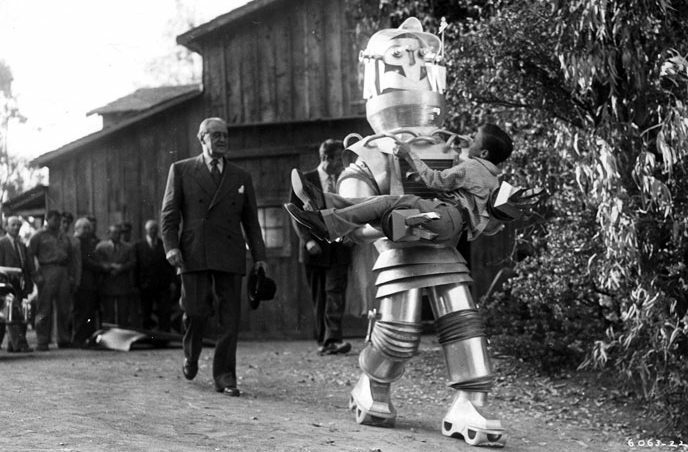 (4/10) Known for its impressive, if clunky, robot, this 1954 independent film is pure kiddie fare. It was adapted from a more serious draft about using robotic test pilots for space flight, but as the budget went down, it became a juvenile ”boy and his robot” movie with a tacked-on communist spy subplot for enchancing the action. Contrary to popular belief, the robot was not designed by Robert Kinoshita. A mildly entertaining run. William Schallert and Lyle Talbot make brief appearances. Tobor the Great (1954, USA). Directed by Lee Sholem. Written by Philip MacDonald & Carl Dudley. Starring: Charles Drake, Karin Booth, Billy Chapin, Taylor Holmes, Steven Geray, Franklyn Farnum, William Schallert, Lyle Talbot. Produced by Richard Goldstone for Dudley Pictures Corporation. IMDb rating: 5.2/10. Tomatometer: N/A. Metascore: N/A. Taylor Holmes as Prof. Nordstrom follows Tobor carrying Billy Chapin. 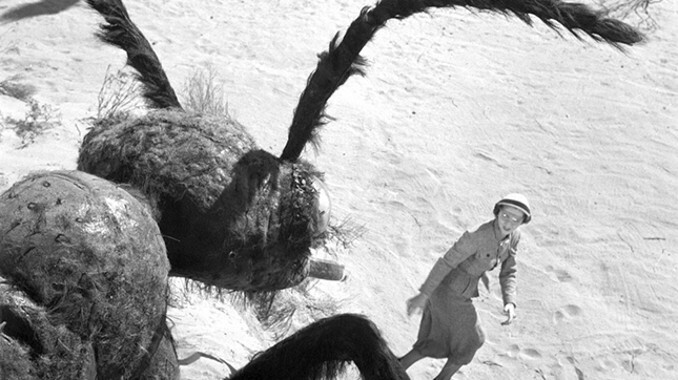 (8/10) The first true giant bug movie, Them!, was released in 1954 and set the template for years to come. However, few, if any, giant insect films have come close to the cinematic quality of the original. Giant mutated ants appear in New Mexico and threaten to wipe out humanity. 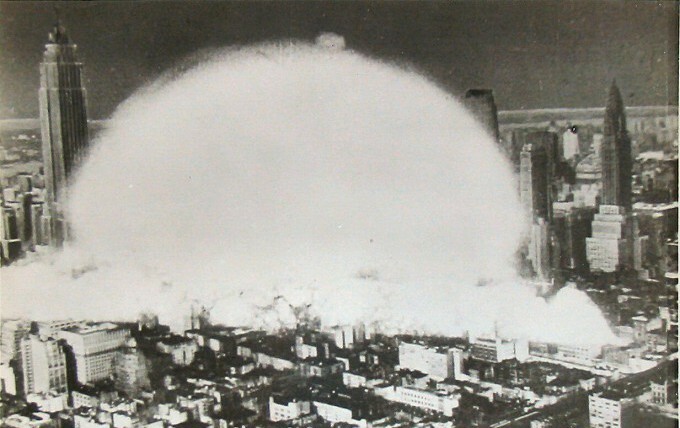 Only Science and the American Way can stop them! Good acting, a smart script, well-held suspense, well-placed comedy, superb full-size giant ant puppets and a fifties Ellen Ripley. Watch out for Leonard Nimoy’s cameo. Them! (1954, USA). Directed by Gordon Douglas. Written by George Worthing Yates, Russell S. Hughes, Ted Sherdeman. Starring: James Whitmore, Edmund Gwenn, Joan Weldon, James Arness, Sandy Descher, Fess Parker, Leonard Nimoy, William Schallert. Produced by David Weisbart for Warner Bros. IMDb rating: 7.3. Rotten Tomatoes: 100% Fresh. Metacritic: N/A. Joan Medford flees the giant ant in Them! (5/10) Ivan Tors’ third OSI film was hugely influential on sci-fi writers such as Michael Crichton, who basically ripped the film off in his book The Andromeda Strain. Extremely ambitious, the film ticks so many boxes of ”first time ever on film” that I can’t fit them all into this introduction. The script doesn’t live up to its ideas and director Herbert Strock fails to create a claustrophobic suspense drama. The viewer forgets that the protagonists are trapped in an underground lab because of the bright Eastman colours and the seemingly spacious science lab, where a giant computer runs amok and killer robots stalk the corridors. Quintessential cold war drama with communist infiltration, nuclear threat, space race science and casual sexism. Gog (1954, USA). Directed & edited by Herbert L. Strock. Written by Ivan Tors, Tom Taggart, Richard G. Taylor. Starring: Richard Egan, Herbert Marshall, Constance Dowling, John Wengraf, Philip Van Zandt, Michael Fox, William Schallert, Billy Curtis. Produced by Ivan Tors for Ivan Tors Productions. IMDb rating: 5.5/10. Rotten Tomatoes: N/A. Metacritic: N/A. 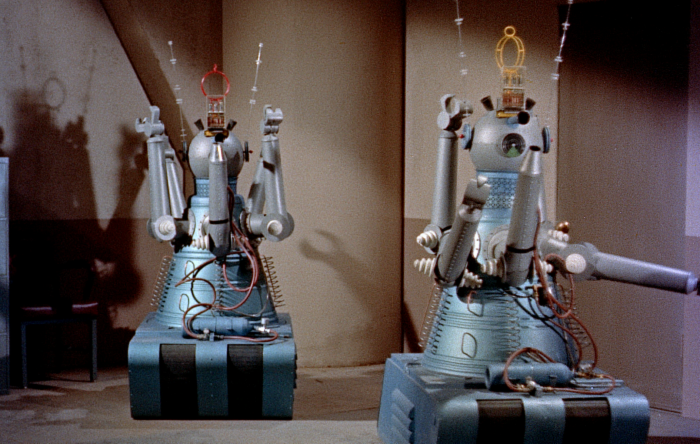 Killer robots on the loose: Gog and Magog! (6/10) In a nutshell: Director Edgar G. Ulmer turns this low-budget movie about an alien visitor to a small village into a visually atmospheric, retro-tinged, intelligent expressionist moral tale. Hollywood brings the first alien invasion film to the big screen with a borrowed castle set and lots of mist and obvious matte paintings. Good acting from sci-fi stalwarts Robert Clarke and William Schallert, but unfortunately the low budget, six-day shooting schedule, a mediocre script and expositional dialogue hamper the end product. 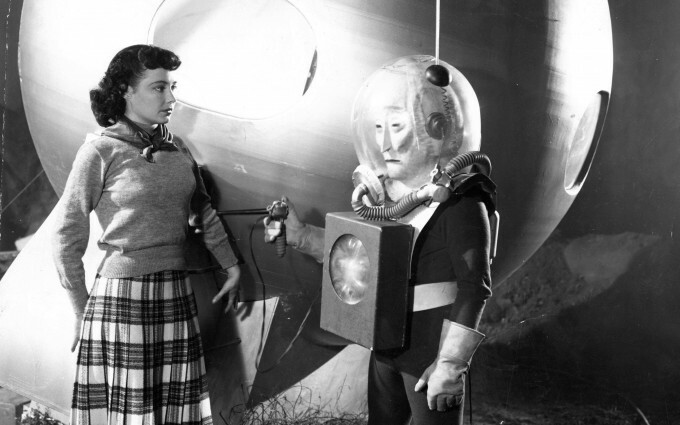 Margaret Field and Pat Goldin meet up by the space pod.